Jerry has a passion for California native plants that started when he lived in a hillside community in South Pasadena back in the 1970’s when he looked at open space hills near his home and saw the potential to restore them to native landscapes. Back then, Jerry knew little about California native flora, except that as youth in Boy Scouts he had roamed, and camped in natural landscapes, enjoying the wildlife and plant diversity he ob-served. He took a few classes, and started to read books on California native flora. And in his hillside community he began by recruiting neighbors to plant native trees and shrubs to begin a conversion of their backyard hillsides from mostly annual weeds to their historic Black Walnut Woodlands and Coastal Sage Scrub plant associations. At work, Jerry’s first career was that of a Civil Engineer working for the City of Los Angeles and the Department of Water and Power. He found that new environmental requirements for mitigating erosion and sediment from graded landscapes required re-vegetation, and for large-scale projects in remote locations that led him to learn more about native plants that could be established and survive on natural rainfall alone. After a career of more than thirty years, Jerry took an early retirement and enrolled in the masters of landscape architecture program at Cal Poly Pomona in 1995. In his master’s thesis, “Linking Learning to Landscapes,” completed in 1998, Jerry together with classmate, Ellen Hu, he studied the Ascot Hills as a potential open space park for the learning and appreciation of nature. Since the completion of this study, Jerry has shared the vision they had created for a passive, open space, nature park with local community members, elected officials and surrounding school administrators and teachers. In 2006 – 2007 Jerry was appointed by Councilmember Jose Huizar to serve on the Local Voluntary Neighborhood Oversight Committee for the planning for the bond-funded improvements to the new AscotHillsPark. In 2007, after the Department of Recreation & Parks conducted extensive disk plowing of the hillsides in AscotHillsPark, Jerry wrote letters to the Department’s General Manager, and then when he was not fully satisfied with the response, he wrote letters to the local news-paper, The Voice. That finally got every-one’s attention that AscotHillsPark was special, with natural resources that de-served better ecological management. And in 2008, he advocated for the establishment of a Park Advisory Board for the new park, even though the construction was not then complete. 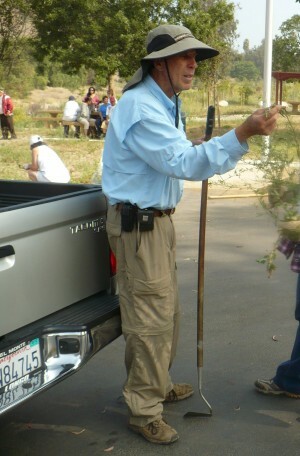 Although not on the Park Advisory Board when it was first established, Jerry attending meetings and helped to advise the Ascot Hills PAB, and in April of 2012 he become a member of the PAB. As a member of the PAB he continues to advocate for funding and projects that will complete all of the planned improvements, including the interpretive nature facility now called the Ascot Hills Trails Pavilion. In 2010, Jerry formed a Green Team with volunteers that work in the park to enhance and restore natural habitat on the second Saturday of each month. The Ascot Hills Park Green Team started out slowly with just a handful of volunteers, but the cadre of volunteers is growing in numbers. Since spring of 2012 the turnout for the Green Team has been greatly bolstered with students and faculty in the EnvironmentalLearningAcademy at Wilson High. In February of this year the Green Team turnout reached a new high of 84 volunteers, including seven first-timers, Biology students from the CSULA. Jerry maintains his optimism, and shares the vision and goals for the park with every-one he meets. He believes that AscotHillsPark is a work in progress and that it will take generations of volunteers to preserve and enhance the natural habitat and education values of this new park.